Undeveloped land should be managed and maintained to ensure good drainage, reduce potential regulatory encumbrances, and protect property value. Landowners are authorized to perform normal maintenance tasks such as mowing, cleaning ditches, repairing culverts and other work necessary to maintain good drainage, use, and access on their property. 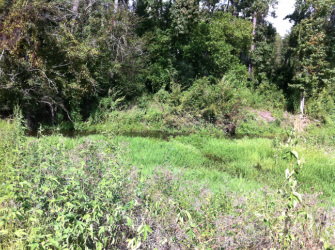 Much of the undeveloped land in the greater Houston area is overgrown with dense vegetation, has flat topography, and is poorly-drained due to neglected maintenance. Existing ditches and drainage swales become clogged with wetlands vegetation, tree debris, and accumulated sediment. Without proper maintenance, ditches eventually overflow and cause adjoining land to be poorly drained, encumbered, and more difficult to maintain. Hydro-ax or Woodgator: Cut and mulches heavy vegetation, underbrush, and tree saplings less than 8" in diameter. Opens up land and allows sunlight and wind to penetrate to the ground and dry the soil. Mows thick vegetation in ditches and drainage swales, improves drainage, prepares land for long term maintenance mowing and facilitates the use of lower cost medium-duty mowing equipment going forward. Hydro-axing is an authorized activity because it cuts vegetation above the root zone and avoids soil disturbance. This work should be specified, documented and performed in a manner to avoid unintentional regulatory violations. Existing ditches and drainage swales should be cleaned and maintained as allowed under law to re-establish good drainage. Maintenance of existing ditches is an authorized activity, provided that the maintenance work complies with the guidelines and procedures in the Corps' Regulatory Guidance Letter 07-02 for drainage ditch maintenance. Landowners should exercise diligence and care to avoid unintentional regulatory violations when maintaining ditches. Ditch maintenance work should be properly specified, documented, and performed in accordance with applicable regulatory guidelines.